Gonna be a short one today because while this is a topic near and dear to my heart, it's not really one with a whole lot of complexity. And that's okay. When I was growing up, we didn't really use our television much, as I have pointed out before, and since we lived pretty far away from most of my friends, I spent a lot of time just chilling around the house, usually reading. 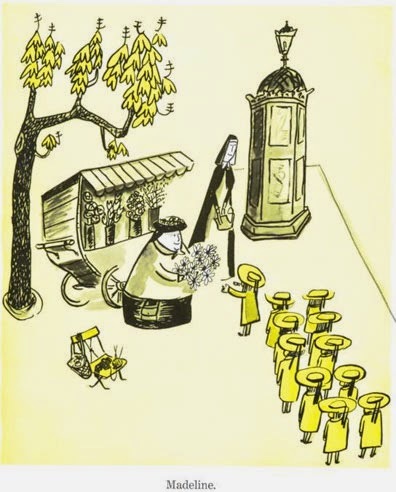 Of all the books we had - until I finally graduated to chapter books, at which point nothing was off limits to me and didn't that have interesting results - my favorite was a huge compendium of the Madeline stories by Ludwig Bemelmans. Having read the books now as an adult, I'm a little bit baffled by why I liked them so much as a kid. They're so...simple. Each book is a very simple problem that is then solved either because Madeline is so clever and wonderful, or is solved when she gets over her cold, or just kind of naturally resolves itself. The conflict is minimal and easily dealt with, and the main character, the titular Madeline, is pretty much perfect in every way. In other words, this is the kind of book that I rail ceaselessly against, and yet it is also the book that I hands down loved the most as a little kid. What gives? Well, I think part of it has to do with the way that these stories, for all that Madeline is a character without flaws and one for whom the world inexplicably works perfectly, are really relatable. Madeline is a relatively normal little girl. She doesn't live with her parents, instead living at a school (I think) in Paris with a bunch of other girls and their dear Miss Clavell, but she does have a regular life. There's breakfast and lessons and a schedule that must be followed. Miss Clavell is loving but strict, and Madeline, for all that she is very fun and witty, is still pretty normal as far as kids go. She gets into trouble and then out of it, and she has a bad habit of asking questions that adults don't want to answer. I can relate. 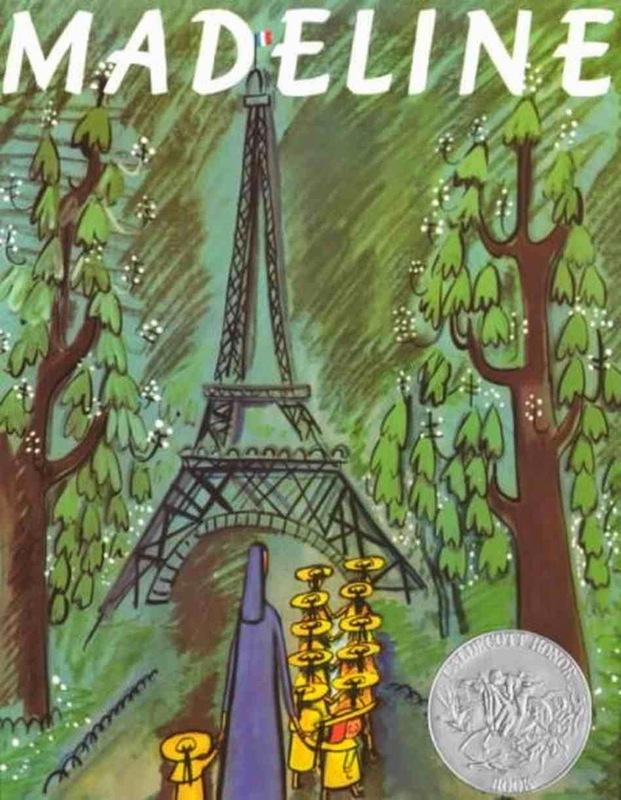 While Madeline's inherent normalness is reassuring, however, I think the reason that five year old me loved these books is actually a little more complex. I think it's more about the aspirational aspects. Not that five year old me could have even said that word. You see, for all that Madeline is pretty normal, she's also pretty not. At one point Madeline paints a picture, signs it M, and then accidentally leaves it on the steps of the Louvre. The curators there find the painting and immediately assume that it was painted by Claude Monet, and put it on display. Madeline then goes to the museum on a field trip, sees her painting, and everyone freaks out. Hahaha, funny story, right? Yes, it is a funny story. But it's also kind of insane. Madeline's painting is talented enough that the curators at the Louvre think it must be a masterwork? Who is this kid? And what about all the other stories? Like where the girls get scared when they go to the zoo, but Madeline merely says, "Poo poo." Kid is fearless. Or there's Madeline and the Bad Seed (my personal favorite for whatever reason), where a boy moves in next door, and Madeline refuses to be cowed by his bad behavior, but in fact manages to rehabilitate their dear Pepito into a functional member of society. And only one person gets mauled by vicious cats along the way. Madeline is an aspirational figure for a little girl, because she gets all the things that you kind of want when you're a kid. She's so talented that grownups fawn over her work. She's so cool that all the other girls at the school want to be her friend. She's so brave that she's not scared of any animals at the zoo, and even when she gets lost in Paris, she's not scared, she has a grand old time. She's even awesome enough that she gets the bully next door to stop being a jerk and be her friend instead. She's awesome. And that's not a bad message to send to little girls. Girls don't tend to get a lot of characters like this. For every Superman that boys get, girls are lucky to get a Wonder Woman. And, I mean, bear in mind that I love Wonder Woman enough to have named my site after her, but Superman has had countless movies, cartoons, solo comic runs, TV shows, and cereal boxes. Wonder Woman had a television show in the 1970s, and she gets to guest star in a movie about Superman next year. Whoo. Maybe it's something about how society as a whole is uncomfortable with female ambition, and the idea of an aspirational female character is intimidating. That's probably true. And it's sad. But even while we rage against the discriminatory practices of the media, and bang our heads against the monolith that is bad children's literature, let's not forget the stuff that is good and does send a good message to little girls. A message that you can be brave and influential and talented and cool, and that's fine, that's great, just go to bed on time. It's a good message to send little girls, and, well, everyone. So, thanks for that, Madeline.